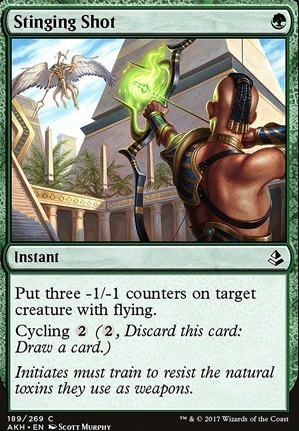 Put three -1/-1 counters on target creature with flying. 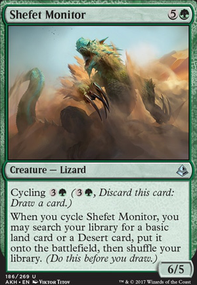 Replaced Stinging Shot with Damping Sphere in sideboard. Grubbernaut, Stinging Shot over Scattershot Archer was a meta call. 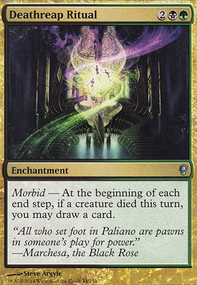 There aren't any Delver decks in my group, but there is Orzhov Mimic aggro with a bunch of fliers with 2+ toughness, and a Golgari dredge/delve list that employs Sultai Scavenger. +1 Merfolk Mistbinder, +1/+2Kumena, Tyrant of Orazca, +2 Merfolk Branchwalker, +3Silvergill Adept, +3 Blossoming Defense, -1 Deeproot Champion, -1 Verdurous Gearhulk, -2 Beneath the Sands, -4 Enter the Unknown, -1 Strength of the Pack, -2 Stinging Shot, -4 Evolving Wilds, +4 Botanical Sanctum, +1 Hashep Oasis, lowering the Forest count while raising the Island count, and cutting down to 22 land would be my suggestion. Blargmax on -1/-1 Counters for Everyone! Thank you for your suggestions! I've been thinking about adding Ruthless Sniper for a while, but now that I have Key to the City, it makes the Sniper that much better. 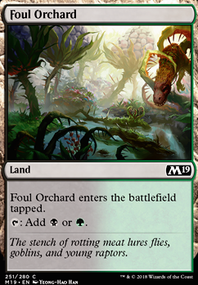 I like the idea of Stinging Shot as a sideboard option at least. 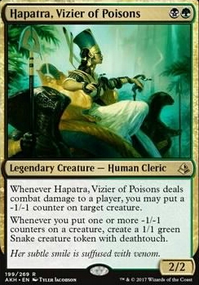 As for Trespasser's Curse, I do have a friend at my local FNM who has a scary token deck (like, 80 humans levels of scary). 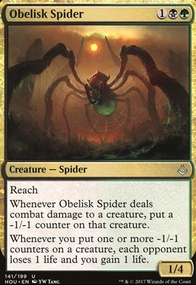 I do see your point about creature deterrence, but let's play a little game of "devil's advocate": perhaps the opposite would happen, and that people with creature-based decks would be encouraged to cast creatures more often to try to overwhelm me. I might keep them in for now, but your point is completely valid and well received. Thanks again!